Rocky Mountain National Park in Colorado is a sublime mix of alpine mountains, sparkling lakes and streams, and a variety of forestland. It has the highest average elevation of any national park in the country. 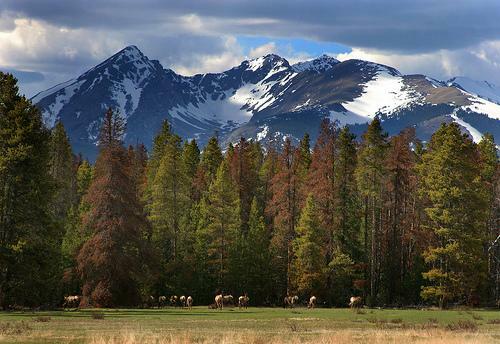 The park features 78 of the Rocky Mountains' peaks, the highest of which still retain glaciers from the last ice age. It is believed people didn't begin living in this tundra-dominated land until about 11,000 years ago when Native Americans settled here. The Continental Divide cuts right through the park, giving its eastern and western regions different characteristics. The east side has more mountain peaks and its water flows into the Atlantic Ocean. The western side of the park is dominated by forestland, and its runoff eventually reaches the Pacific Ocean. The lowest points in the park are made up of pine forests, fir trees, and grassland. Above the timberline are glacial meadows where alpine wilderness and mountain slopes meet. The tundra is at the highest points in the park, and snowy, extreme weather is a constant. The lowest points of the park can get up into the 80s in the summer, but the upper reaches are often stormy and always cold, so visitors should come prepared for anything. While most of the designated parkland reaches above the timberline, there is still plenty of captivating areas to cover within reach of the vast mountains. At the foot of Hallett's Peak is Bear Lake, which rests near the middle of the park. It is a popular tourist attraction because several trails begin there ranging from easy hikes to strenuous climbs. If you climb higher from there, you'll reach Dream Lake encompassed with tall trees and rugged peaks. Beautiful Emerald Lake is a short walk from there. Both lakes have uphill trails that are snowy most of the year. Wild Basin is at the south of the park with several more trails leading into the wilderness. The Never Summer Mountains makeup part of the Continental Divide and rise more than 12,000 feet. These mountains were formed by volcanic activity, but still, have vegetation and many alpine lakes among them. A panoramic view of this range is possible from Trail Ridge Road, which reaches high into the mountains. Old mines and ghost towns can be found up in this area. The highest and most sought after mountain area is Longs Peak, which rises 14,259 feet above sea level and can be seen throughout the state. A climb up to it provides breathtaking views of the rest of the park. Douglas Fir and Ponderosa Pines are predominant trees in the lower land's montane forests. Subalpine fir trees along with Engelmann Spruce grow in the higher subalpine regions. Rare wildflowers grow close to the ground in the glacial meadows to withstand extreme weather conditions. A variety of wildlife can be found throughout the park as well. Many different kinds of elk are abundant in this area. Moose, bears, bison, chipmunks, and mountain lions are among the 66 mammal species in the park. The variant terrain in the park makes this an ideal habitat for 280 types of birds including the Bald Eagle. Many of the species are unique to the mountainous region, so birdwatching and other wildlife viewing are great for anyone visiting the park. Countless trails make this park a hiker's paradise. Horseback riding is a fun way to enjoy the views at the more temperate locations. Snowmobiling and other winter activities such as snowshoeing, cross-country skiing and dog sled rides take place into the mountains. Kayaking is popular on the rivers in the summer. Many people also like to boat, fish, and ski on the lakes in the park, especially Grand Lake, which is the largest natural lake in Colorado. Rocky Mountain National Park is a place with a little bit of everything and attracts about 3 million visitors every year. For more information or to make reservations at the Rocky Mountain National Park log on to: www.NationalParkReservations.com or call toll free 855.238.0513.